The Rev. Dr. Wyatt Tee Walker, a fierce civil rights advocate and strategist over many generations, died Tuesday at his home in Chester, Va. He was 88 years old. His death was announced by the Rev. Al Sharpton of the National Action Network on Twitter; Walker was the 27-year-old organization’s first board chairman. As with many unsung heroes of the civil rights movement, Walker’s name may not be as familiar as some others, but his works were long. 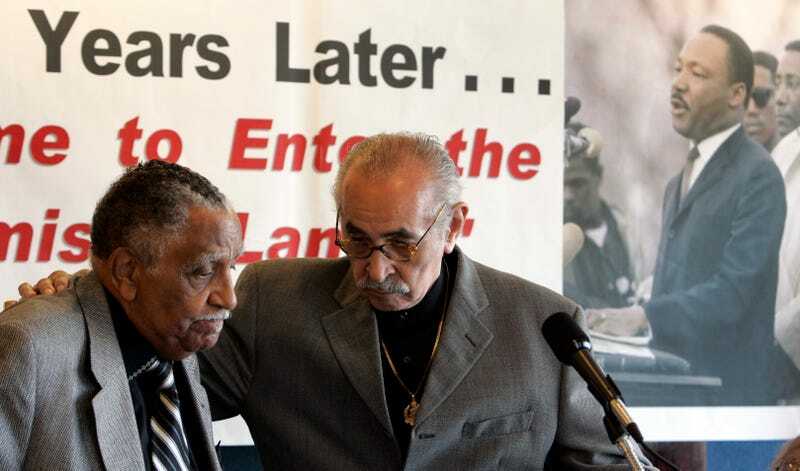 As an ordained Baptist minister, the good reverend had his hand in everything from the desegregation tactics of King’s Southern Christian Leadership Conference to fighting housing discrimination in New York City. The New York Times reports that Walker also helped to supervise South Africa’s first fully representative elections in 1994, after the apartheid regime fell there. Walker helped circulate one of King’s most deeply felt and inspiring works, “Letter From Birmingham Jail,” one of the most important blueprints of the civil rights movement, and helped to organize the 1963 March on Washington, which culminated with King’s historic “I Have a Dream” speech. Wyatt Tee Walker was born on Aug. 16, 1929, in Brockton, Mass., the 10th of 11 children, and a grandson of slaves. He received an education at the HBCU Virginia Union University, earning a bachelor’s degree with honors, in both physics and chemistry, at age 19. He pledged the Gamma chapter of Alpha Phi Alpha Fraternity and met King (also an Alpha) while in college. He also obtained his Bachelor of Divinity degree from Virginia Union’s Graduate School of Religion. In 1950 he married Theresa Edwards, with whom he eventually had four children: Wyatt Jr., Robert, Earl and Ann. Walker began his civil rights work in Virginia and served as president for five years of the Petersburg branch of the NAACP and as state director of the Congress of Racial Equality, which he co-founded in 1958. He joined the SCLC in 1961—personally recruited by King—and eventually moved to Atlanta to serve as its first full-time executive director. In 1965 Walker moved to Harlem, where he initially was a minister at the historic Abyssinian Baptist Church. Two years later, he became the pastor and chief executive of the Canaan Baptist Church of Christ, a post he held until 2004. During the 1970s, Walker served as urban affairs specialist to New York Gov. Nelson A. Rockefeller, helping advise on racial relations and integration. In 1975 he completed his doctorate at Colgate Rochester Divinity School. Of his myriad civil rights works, the Times reports that as pastor of Canaan, Walker oversaw extensive development of church-sponsored affordable housing, housing for the elderly, and what the church calls the oldest senior-services center in Harlem. He also established Harlem’s first charter school, the Sisulu-Walker Charter School (named for Walker and the South African anti-apartheid leader Walter Sisulu). In addition to the National Action Network, Walker had been chairman of the Freedom National Bank. After retiring from Canaan after suffering a series of strokes, he moved to Virginia in 2004, where he remained until his death. Harlem’s Schomburg Center for Research in Black Culture collected his papers from the period 1963-1982. They include both personal and official correspondence, papers and lectures on a wide variety of topics and are available for research.